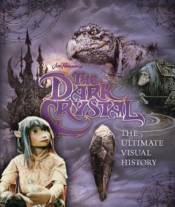 The Dark Crystal: The Ultimate Visual History is the definitive collection of rare artwork, interviews, and on-set photos from the beloved Jim Henson fantasy classic. This deluxe coffee-table book contains an in-depth look at the day-to-day production of the film and showcases a huge range of incredible visuals, including candid set photography, previously unseen concept art, storyboards, production notes, and more. The book also features a plethora of amazing removable items, such as script pages, notes and sketches from Henson, and other unique treasures.